How to choose a biomass boiler? With so many biomass boilers to chose from, it can become daunting to know which one to choose and what is right for you. The following will help you to decide which type of boiler is going to meet your specific requirements whilst also saving you money on energy costs. The first step in the decision-making process is to decide how much heat is required as this will indicate which size boiler is needed. It is inefficient to use a boiler which generates surplus heat to your requirements. If you are unsure what size of a biomass boilers will meet your requirements, we recommend that you speak with a member of our team. Once the size has been determined, you can then proceed to investigate the boilers that are available in that particular size. 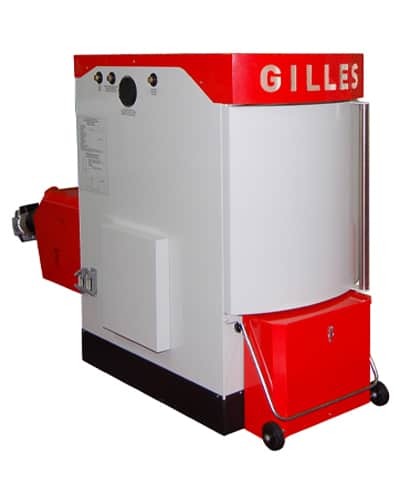 Through our partner Gilles we provide industrial, commercial and domestic biomass boilers (wood chip, pellet, container, log gasification and industrial boilers) ranging from 12.5 kW up to 5.000kW (5MW). Below we will explain these in a little more detail for you, but don’t hesitate to contact us if you need help in choosing the right boiler for you. It is also important to consider the types of fuel that the boiler uses, as different boilers require different types of fuel storage and fuel feed equipment. You need to decide if you need the fuel to be fed to the boiler automatically. Pellet and chip boilers use automatic fuel feeders which refill them at regular intervals, whereas, Log-burning boilers have to be filled with wood by hand. Indeed, logs require considerably more work, for example you will need a lot of logs to heat a whole house, but they can be cheaper than pellets if you have a good local supply. Pellets and chip boilers are much easier to use and much more controllable than logs, they can run automatically in much the same way that gas or oil boilers operate. If you would like to discuss your own requirements in detail, please contact us on 051 364 054. Woodchip boilers can be used to heat a large house, several houses or in situations where additional heat is needed for another purpose. Woodchip boilers are the ideal solution for many buildings which require space heating or hot water. This includes: shops, schools, hotels, hospitals, nursing homes, offices, food producers, to name a few. The Gilles wood Gasification boiler ranges from 20kW to 48 kW and is over 93% efficient. It has an oversized feeding tube allowing it to take logs of up to half a meter. The excellent design of this boiler allows for easy ash removal and cleaning. Furthermore, it allows for comfortable stoking through large slanted fire door. The high-performance industrial biomass boilers is produced with a stress-free welded construction. The thermally insulated door at the front swings out completely permitting free access for cleaning all the boiler flues. The boiler is constructed in accordance with the natural combustion process of the fuel wood. The gasification combustion chamber built on a direct pass principle is fitted with a variable, ceramic (replaceable) radiator roof cladding. High combustion temperatures and a long furnace duration of the gases is the guarantee for a clean burning process. Gilles industrial boilers operate at 93% efficiency. Fuel is fed automatically into the industrial boiler. Many boilers are set up to deal with only one fuel type, but Gilles woodchip and industrial boilers are multi fuel. As Gilles woodchip boilers can burn a variety of fuels such as woodchip, wood pellets, wood logs, miscanthus, willow, straw, hay, grain, cereals etc. they ensure stability of fuel supply. This also helps ensure your business if future proofed against price fluctuations of fuel.Before the boiler is purchased, it is important to consider the installation requirements for the system and how it can be integrated into a pre-existing heating system if relevant.